At present, pedestrians are inconvenienced by 55th Street. The sidewalk is 6′ wide for most of the street west of Harper. This is too narrow to accommodate people walking and the streetlights, signs, benches, and plantings in the sidewalk. 55th Street also narrows in some critical locations such as at Dorchester and adjacent to Nichols Park. The sidewalk is also congested around Woodlawn Ave where the 6′ width is insufficient for the number of people walking there. Sidewalks on 55th are narrowed by sign and lamp posts. Many students crossing 55th street at Greenwood and at University have to contend with vehicles blocking sightlines and conflicts with turning vehicles. At Kimbark and Kenwood, large numbers of children and strollers cross a street with wide lanes and queued turning vehicles. Pedestrians at Dorchester and Blackstone have to detour east or west where University Park Condominiums restricts access across their property. Pedestrians frequently cross in the S-curves on either side of the building, where sightlines are severely restricted. These same curves and trucks loading restrict the visibility of many pedestrians crossing at Harper. At Lake Park, crossing distances are long and crosswalks are only available on 3 sides of the intersection. On the northern leg of the intersection, many pedestrians enter the crosswalk during the dedicated left turn phase for cars off 55th Street. East of the rail viaduct, the street narrows, the sidewalks broaden, and vehicles encounter stop signs or traffic signals at all intersections. Pedestrians have a much easier time asserting their right of way in this environment, although crossing distances are still unnecessarily wide, especially at South Shore Drive. People riding the 55 and 171 buses experience excessive bunching, inadequate benches, and minutes added to their journeys by frequent stops. Between University and Blackstone, there is a bus stop every 300 to 400 feet. Such frequent stopping increases the travel time of customers on the bus far more than it saves the time of customers walking a shorter distance to their stop. It also increases conflicts with cyclists and reduces parking capacity. The CTA’s service standards are for stop distances to be between 660 and 1320 feet (1/8 to 1/4 mile). Congestion can slow buses, especially westbound in the morning when approaching Kimbark buses use the protected bike lane between Woodlawn and Kenwood as a bus lane to avoid weaving and to bypass congestion. Bus stops crossing 55th on Cottage Grove, Lake Park, and Hyde Park Boulevard are all deficient for various reasons. At Cottage Grove, low curb heights slow bus boarding. The northbound bus stop is nearly 120 feet from the corner in order to accommodate an unnecessary widening of the curb, increasing the walking distance for connections from the 55 bus. At this location, the 55 does not have a bus shelter westbound despite having more than 450 boardings per weekday. 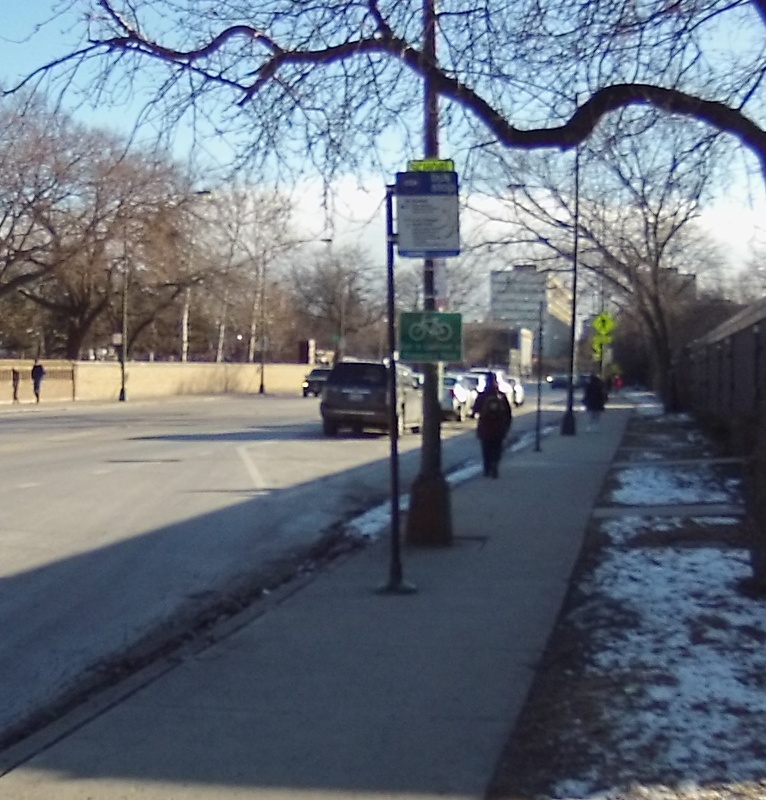 At Lake Park, the nearside location of the bus stops, especially southbound, forces buses to wait for cars to clear from the intersection before being able to load customers. Nearside stops also encourage drivers to illegally turn right in front of the bus and reduce the capacity of the intersection for vehicles. The traffic signal blocks wheelchairs from accessing the northbound bus stop and makes access difficult for other customers. At Hyde Park Blvd., the bus stops are too short to accommodate the 60′ long buses that serve them. The buses block the crosswalks at the intersection, buses behind, and other traffic. Often parked cars encroach upon the stops and further limit the space available, especially at the southbound stop. The university’s UGo shuttle buses also supply frequent transit service along 55th Street, especially at night. The UGo buses don’t use the CTA bus stops, requiring passengers to step into the street to board the bus. At 55th and Harper especially, the bus stops just before the crosswalk eastbound with enough room for cars to pass on the left. These cars may run into an unseen disembarked student using the crosswalk. Since the installation of protected bike lanes on 55th, cycling has greatly increased on the street. There are some issues with the current design. Conflicts with cars and buses still occur at mixing zones where bicycles and right turn cars share lanes. Parked cars block the sightlines of right turning vehicles off 55th and those entering at cross streets. Parked vehicles often block the bike lane, especially westbound between Dorchester and Kenwood and between Woodlawn and University. Recently, cars have been parallel parking illegally by blindly pulling forward into the bike lane before straightening out in the parking stall. Merging quickly across traffic into the left turn lane. Using crosswalks to ride clockwise with the signal around two legs of the intersection. The quality of the 55th Street bike lane progressively declines towards the east. At Dorchester, the lane loses parking protection while the lane ends altogether at the rail viaduct. Both here and on Ellis south of 55th, bicycles have to merge suddenly with other vehicles under the viaduct while the road centerline shifts left. At Lake Park, there is no easy and safe method to access the Hyde Park Shopping Center. 55th Street presently serves vehicles well by having fewer controlled intersections than other east-west street in the neighbourhood. Congestion on 55th occurs most often during school hours when a large volume of cars turn left from both directions onto Kimbark, where no left turn lane exists. During the 2012 streetscape redesign, traffic signals at Cottage Grove, Ellis, and Woodlawn were intended to be synchronized to provide a 25 mph green wave in both directions. This green wave is meant to provide vehicle capacity while discouraging speeding. The signals became desynchronized shortly after installation and remain unsynchronized today, often encouraging speeding in order to catch the next green. Some vehicles traveling westbound turn right onto University, speed up the frontage road, and enter the main road again at Ellis in order to avoid waiting behind traffic at the light. At Lake Park, northbound vehicles turning left often queue and block the vision of southbound left turning vehicles. Free parallel parking on 55th is fully occupied during weekdays. On weekends and holidays, parking is sparsely used west of University, but still heavily used to the east. 55th has two sections of pay parking. The one at Bank Financial is used for at most 15 minutes at a time by bank customers while the other, at Harper, is only used by offloading trucks. Parallel parking at Bank Financial is stressful as cars coming around the S-curve cannot be seen pulling out. Chicago’s Complete Streets policy prioritizes (in order of importance) the convenience of walking, transit, cycling, and then driving. These priorities are almost exactly reversed on 55th Street. I will look at solutions for the 55th Street Streetscape in a future post. This entry was posted in Automotive, Cycling, Transit, University of Chicago, Walking. Bookmark the permalink.